If you are born with a big nose, you may be teased mercilessly during school and being called with all kinds of names. Hence, you may hate your big nose so much that you are seriously considering going under the knife for a plastic surgery to alter it. Before you do it, I would like you to reconsider. In Eastern face reading, certain shape of big nose carries a sign of prosperity, wealth and fame. Our well known Hong Kong star Jackie Chan is famous for his big fleshy nose. You would seldom see anyone able to keep their wealth for long if they have skinny boney nose. So…in the end do consider…when you have a comfortable life being able to afford the stuff you want…..now is having the last laugh now? True friends would accept and embrace you for who you are. They are not going to let your big or huge nose get into the way. Is it worthwhile to spend your life doing stuff to try to get other’s approval? Whose life is it, anyway? Save all the things that make you unique. 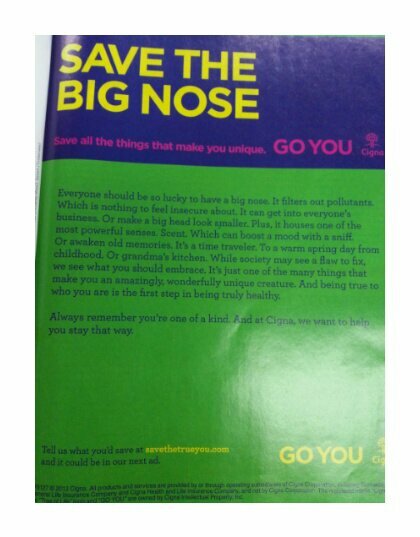 Everyone should be so lucky to have a big nose. It filters out pollutants. Which is nothing to feel insecure about. It can get into everyone’s business. Or make the big head look smaller. Plus, it houses one of the most powerful senses. Scent. Which can boost a mood with a sniff. Or awaken old memories. It’s a time traveller. To a warm spring day from childhood. Or grandma’s kitchen. While society may see a flaw to fix, we see what you should embrace. It’s just one of the many things that makes you an amazingly, wonderfully unique creature. And being true to who you are is the first step in being truly healthy. Always remember you are one of a kind.